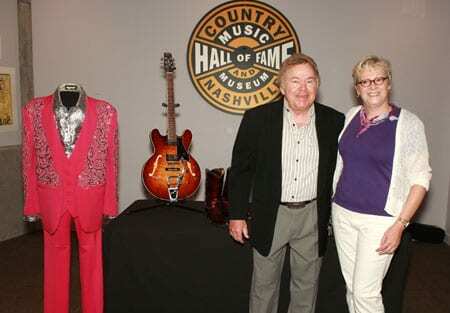 Country Music Hall of Fame member Roy Clark donated several items to the Country Music Hall on Fame® and Museum on Saturday (7/18). The artifacts, which will be on display beginning August 1 in the Museum’s permanent exhibit, include a magenta three-piece Manuel suit with an embroidered silver lame´Manuel shirt, patent leather Tony Lama boots, and a Heritage H-535 Roy Clark Signature model electric guitar. Mercury Nashville recording artist Billy Currington will perform on CBS’ the Late Show with David Letterman Wed., Aug. 19. His single “People Are Crazy” tops the monitored charts this week, marking his fourth No. 1 and fastest-rising single of his career. It is the second No. 1 from Currington’s album Little Bit Of Everything, which is at No. 10 on Billboard’s Current Country Albums Chart. The Lost Trailers are featured on cmt.com’s Unplugged At Studio 330. The acoustic performance includes “Holler Back,” and newest single, “Country Folks (Livin’ Loud).” Viewers can also see exclusive interviews. The Producer’s Chair presents an interview with Chuck Howard (LeAnn Rimes, Kid Rock, Hank Jr., Johnny Cash and more) Thurs., July 23, 6 PM at Douglas Corner. The legendary Flatlanders— Joe Ely, Butch Hancock and Jimmie Dale Gilmore — appeared on The Late Show With David Letterman last night (7/21) before heading overseas for a three week tour of Europe. Upon their return, the New West Records band will be on NPR’s Mountain Stage on Aug. 16, and debut at the Grand Ole Opry on Sept. 18. August 7-9 will be a tax free weekend in Tennessee. Exemptions include clothing $100 or less per article, computers $1500 or less, and school supplies $100 or less.